Michael Meehan has put his money where his mouth is. Although he made his excellent reputation in the kitchens of prestigious Long Island restaurants like Tupelo Honey, H2O and Clearwater, he changed his tune not too long ago. In a recent conversion, he noted the evolution of Long Island dining patterns. His principle observation was that causal restaurants - bistros - are more popular than ever while upscale, fine-dining spots are not proliferating presently or likely be as important in the future as they have been in the past. 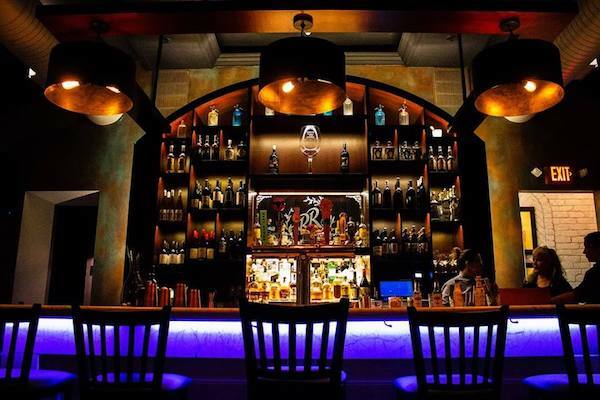 To emphasize the point, Meehan has become part-owner of Radio-Radio, a barbecue restaurant in Huntington Village and is also involved with Vauxhall, another laid back spot there. Even more significantly, he and his wife Veronica invested their resources in a slick new bistro, River Road Bistro, in Oyster Bay. It’s location on Mill River Road is especially significant for it vividly illustrates the changing restaurant scene. The best known previous tenant, the elegant and upscale Mill River Inn, was where Michael Meehan was the chef. It was here that he was first noticed as a truly elite kitchen commander. The rustic River Road Bistro, which opened in January, features a beautiful bar, a fireplace and what looked like about thirteen tables. It’s still a work in progress with many of the farm to table dishes scoring and a few missing the mark. 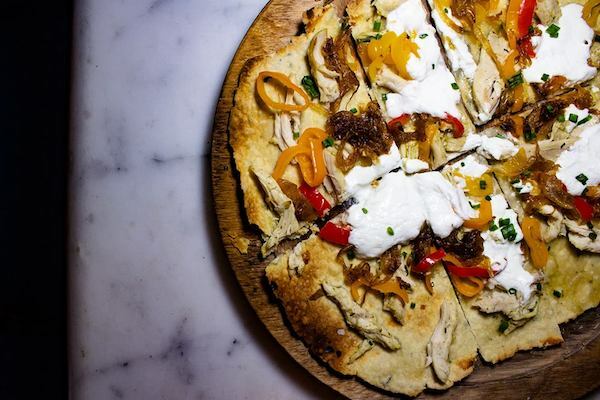 Among the latter is a potato-herb flatbread festooned with pulled jerk chicken, pickled peppers, onion and goat cheese, it’s a meticulously composed dish whose appearance promises more than it delivers. A better bet among the snacks and shares is the Crescent Farm duck in a jar, silken duck confit rillette with- six point ale bread croustades. 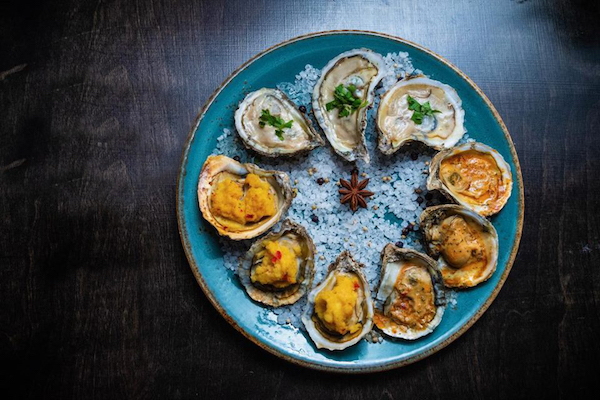 Oyster lovers will be rewarded with the opportunity to order three different preparations opting for one, two or four of each. Two are recommended, one is not. The half shell with lemon green peppercorn mignonette and the char grilled with tomato absinthe butter picks are spot on. But the corn bread, stuffed and baked is bland from that stuffing. 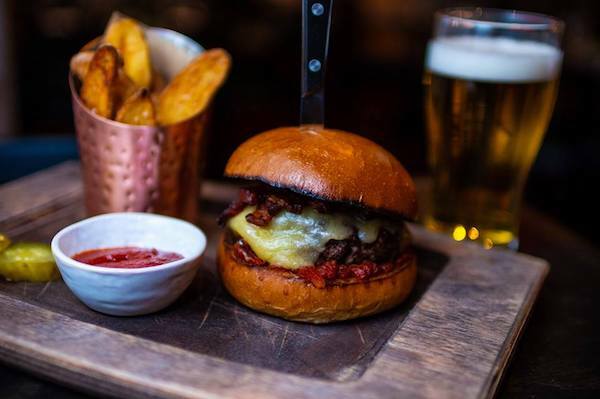 A primo blend burger that arrives with smoked cheddar/bacon and lardons/ tomato jam was as impressive a version or this dish as is available on the Island but its juicy, tasty, perfectly seasoned desirability wasn’t duplicated when we ordered it a second time. That was not a problem with two other main course choices. The jumbo lump crab cakes with red mustard greens, pickled corn relish and red pepper puree and a husky, smothered Berkshire porterhouse pork chop enhanced by its Vidalia onions, pickled peppers, green beans and wild greens are, as they say, worth the price of admission. The smores dessert, a Graham cracker crust affair with Nutella ice cream and whipped flakey marshmallow is hands-down pick.